Tuesday morning I was sitting in the Amtrak waiting area at New York’s Penn Station when I glanced to my right to see if my track number had been announced. 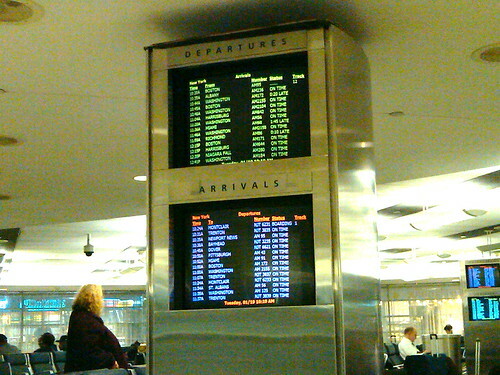 There were two screens, one stacked on top of the other, with two metal plaques that indicated Departures on the top and Arrivals on the bottom. Given that I was departing the station, I looked at the top screen and scanned for my train. I was due to leave at 10:35am so I looked down the left side of the screen, and when I spotted the time (second in the list), I moved my eyes to the right to find the track number. Except as I read across, I noticed that the location was marked as Albany. Given that I was on my way to Philadelphia, in the opposite direction, I was a bit confused. I scanned down the list for a train going south, and saw that the following train was going to Washington. When I moved my eyes to the left again, I saw that the train was scheduled for 10:44. Now I was convinced that I’d gotten the time wrong and began to panic that I had missed my train. As I gathered my things and started to stand up, I just happened to look at the Arrivals screen below and noticed a 10:35 train listed there as well, marked as Newport News. When I scanned to the right and saw that the train number was 95, I vaguely remembered that being my train. The Arrivals were displayed on top and the Departures on bottom — opposite of what the plaques indicated. I desperately wanted to call over a Red Cap and explain the whole thing, but just then my track was announced…and I had to run. As I hurried off I couldn’t help but wonder how many other passengers would experience a scare that day, just how long it has been backwards, and when might someone with the power to change it become aware of the problem.